As kids make the transition to adolescence, with its peer pressure and new temptations, it's more important than ever to reinforce the biblical values they've grown up with. J.A.M. Jesus and Me® helps kids at this crucial age to understand that Jesus stands with them as their source and guide in all things. Scripture lessons, coupled with life-related stories, take pre-teens deeper into the Word and strengthen their relationship with Jesus Christ. Activities; applications for the week ahead; book, video and music reviews; and special economic and sports columns help keep kids grounded and on the right track. The Teaching Success Kit includes Student Magazine, Teacher Guide, Visuals, Activities, Quiz, and Black History Personalities Poster and Profile Sheet. Like all our curriculum, J.A.M. 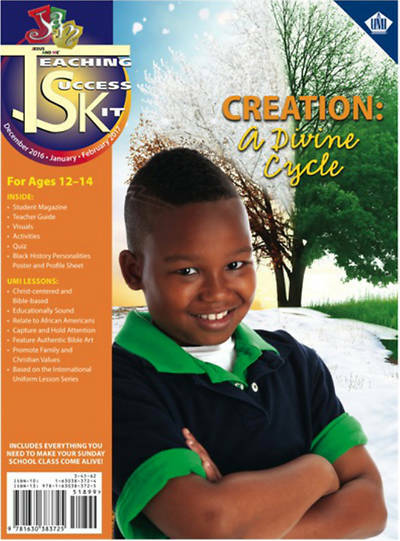 Jesus and Me is based on the International Uniform Lesson Series.